Calling all patriots: Dan Shannon wants you to give your old computer to the family of military personnel in the Persian Gulf. Shannon is working with retailer Micro Center and refurbisher Redemtech to rehab and distribute the computers for free. Bring them to Micro Center retail stores at 80 E. Ogden Rd. in Westmont or 2645 N. Elston St. in Chicago Friday, Saturday or Aug. 24. Check at www.operationhomelink.org for details about which computers are eligible. Edith Avila said communication with her Illinois National Guard husband, Cpl. Jaime Avila, has doubled since receiving a Homelink computer. They have two young sons, and Avila will be in Iraq until January, or maybe July, his wife said. Dan Shannon has never served in uniform. Nor does he hail from a military family. But when the real estate manager saw news reports of soldiers sent overseas and their families left behind, he searched for ways to help. The result is a non-profit organization he founded, Operation Homelink, which provides military families in the U.S. with refurbished computers so they can e-mail their loved ones abroad. This weekend, the organization kicks off its first computer donation event in Chicago. "I thought that if I was in the shoes of those men and women, I would want people to help my family," Shannon said. "And this is one thing we can do for those men and women who are making such a huge sacrifice. I've got a wife and four kids, and I can't imagine being a wife here whose husband is not only away but in harm's way." The event will be held at two Micro Center stores Saturday and Sunday, at 2645 N. Elston Ave. in Chicago and 80 East Ogden Ave. in Westmont. Donated computers must be in good working condition and have a modem. Shannon said the organization fills an important role. Although many troops have access to high-speed computers on ships and in camps, many of the family members they leave behind do not own PCs, he said. That forces families to rely on regular mail or infrequent phone calls. Edith Avila, 26, of Chicago, said she had to make due with spotty communications with her husband, Jaime Avila, a corporal in the military police, after he was sent to Iraq in February. Two weeks ago, Operation Homelink set her up with her own computer. Now, Avila and her husband exchange messages every three days, and sometimes in between. "The other day my 2-year-old, Jovanni, fell and had to go to the hospital to get stitches. I e-mailed my husband that night. And then within a couple of hours he called me because he had just gotten the e-mail," Avila said. Hundreds of computers blocked the aisles at two Chicago area Micro Center stores this past weekend. Many, though, weren't for sale. More than 200 computers were collected courtesy of Chicago area residents taking part in a donation drive for Operation Homelink, a local non-profit. The group provides free, refurbished computers to families of military personnel deployed overseas. The three-day drive went so well, it is being extended until Labor Day, said Operation Homelink™ founder and president Dan Shannon. Shannon--a real estate executive from La Grange with no military ties--started Operation Homelink in February after hearing about a similar program in San Diego. During a visit to an Illinois National Guard base in North Riverside, Shannon saw a poem tacked on a wall written from the viewpoint of a soldier's child. "That was literally my inspiration," said Shannon, who posted the poem on the group's Web site. "I just have a huge appreciation for those in uniform and for all they're doing," Shannon said. Through friends, Shannon was able to get pro bono legal help from Mayer Brown & Platt and public relations help from Edelman. He partnered with Micro Center's subsidiary, Ohio-based Redemtech, which cleans up the computers and ships them off. Up until this weekend, the group had sent out 50 computers to families across the nation. Edgewater resident and Marine mom Felix Trujillo got hers in July. Trujillo's son, Eric, 20, was deployed to Kuwait in January. But until she got a computer, she had heard from her son only once by phone. Letters took too long. Lance Cpl. Eric Trujillo, who is now home for a brief stay before heading to his base in California, said he is looking forward to more frequent contact with his family via e-mail. "I can always drop them a line, and my little brothers are always on [the computer]," he said. Computers in good working order can be donated through Aug. 31 at Micro Center stores at 2645 N. Elston and 80 E. Ogden, Westmont. Corporations are encouraged to donate. For information, go to www.operationhomelink.org. Before a charity helped Yolanda Resendez discover the power of the Internet, the only time she could communicate with her son, Juan, was when he called from Iraq where he is stationed. If she missed a call, his voice message would have to suffice. Resendez recently received a computer from Operation Homelink, a not-for-profit organization that provides free, refurbished computers to the families of deployed military personnel. With her new computer, she is able to e-mail Juan whenever she has something to share. "I can e-mail my son, and my younger son can e-mail his bigger brother," Resendez said. "It helps us if we can e-mail him. If I can't talk to him personally, e-mail is a good enough for me." Dan Shannon, founder of Operation Homelink, started the program when he heard of a similar one in San Diego. "These computers that are sitting in people's storage are collecting dust," Shannon said, "and wives and mothers back home can now have a way to e-mail the troops overseas." Shannon's group partnered with Redemtech, a computer recovery firm that offered their services for free. Operation Homelink takes in old computer donations, and Redemtech refurbishes them. To date, the group has delivered 50 computers. They hope to add to that number with a donation drive this weekend. Operation Homelink will be accepting computer donations at Micro Center stores in Westmont at 80 E. ogden Ave. and in Chicago at 2645 N. Elston. donations will be accepted from 10 a.m. to 9 p.m. Friday and Saturday and from 11 a.m. to 5 p.m. Sunday. Computers must have a modem and color monitor and be able to run Windows 98 or higher or be a Pentium I-166 megahertz processor and have 32 megabytes of memory. Specifications can be found at www.operationhomelink.com. Shannon also added that the group will accept component parts, such as keyboards and monitors. All personal information will be erased from the computer before delivery. Resendez is so happy with her computer that she has told the members of her family readiness group, a support group for her son's 933 MP unit, all about the program and online application. "I don't get (anything) out of it but happiness," Resendez said. "It makes me feel good about having helped out other families like I was helped." Operation Homelink, a local nonprofit group that provides computers to families of deployed military, is hosting a computer donation drive Friday, Saturday and Sunday. Donated computers are refurbished and given to families to correspond with soldier overseas. Computers will be accepted at the Micro Center, 2645 N. Elston Ave. They must be in good working order, include a modem and be capable of running Windows 98. For info, call 312-863-6203. Thank you to everyone who participated in our computer donation drive at the two Chicago MicroCenter locations! We collected roughly 500 computers donated from individuals and another 400 from corporate donors. In our pilot program, Operation Homelink delivered computers to the 333rd Military Police Company of the Illinois National Guard. 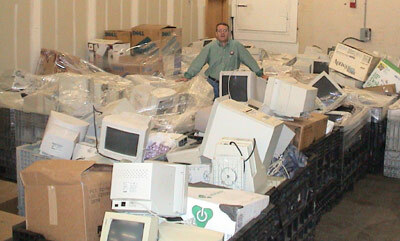 Founder Dan Shannon with donated computers from MicroCenter's Elston location.